Asking the right probing questions is key to getting the right answers. So, let’s take a look at some effective questioning techniques. The most important thing to remember is proper positioning when questioning a customer, as this will allow you to ask almost anything. This is very much dependent on good rapport building and listening skills. To do this, advisors need to pay close attention to what the customer is saying, mirror the customer’s tone and assert control over the customer’s issue. Some other tips for building rapport, such as repeating the customer’s problem, are great for helping you to create probing questions unique to the customer’s situation, but this does take time. For those that seem to be in a rush, you can frame the conversation differently. There are contact centres who ask advisors to only use open questions for probing. This is with the thought that open questions will draw more information from the customer, which will allow the advisor to better attach a product or service to the customer’s needs. However, Christine Knott believes that open questions should not be used in isolation, highlighting that closed questions (i.e. questions which only allow a yes or no answer) also have their benefits. Open questions give information; closed questions give confirmation. 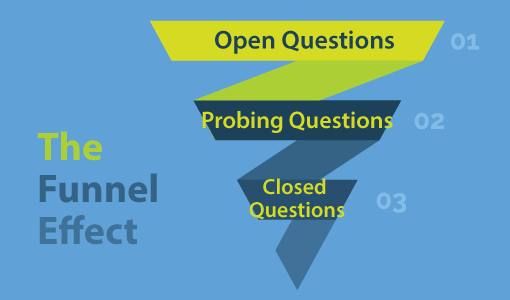 Asking a mixture of open and closed questions is key to the “the Funnel Effect”, which is a three-step questioning technique for contact centre advisors. The three stages of the Funnel Effect are discussed further below by Lindsey McGhie. Step 1: Asking Open Questions – Try to start with open questions about the subject at hand, as this will give you all the information you require to take the conversation further. Step 2: Asking Probing Questions – These are the questions which will allow you to delve deeper into the customer’s answers to your open questions, finding out the reasons and emotions behind those answers. 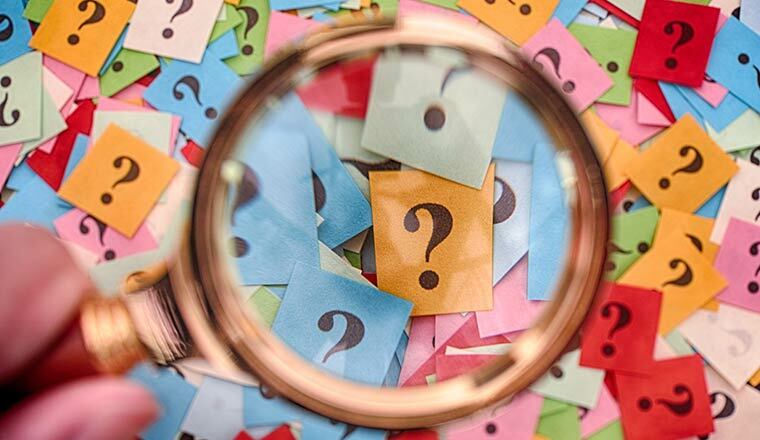 Step 3: Asking Closing Questions – Asking closed questions allows you to confirm both your own and the customer’s understanding of what has been discussed in that specific line of questioning. While the Funnel Effect is a nice guideline, try not to use it rigidly, as the advisor may need to confirm the information they receive from an opening question with an immediate closed question. Also, the advisor may also need to open with a closing question, to immediately confirm that they are speaking with the right person. So, while it’s good to use all three question types, try to use them intermittently and don’t get hung-up on the order that you use them. When using probing questions, TED can become your best friend. TED stands for three simple words that will help you get the answers you are looking for: Tell, Explain and Describe. Tell me, how will that affect you? Tell me, what was your main motivation for calling? Explain to me, what impact has this had on your…? Explain to me, how did this situation begin? Explain to me, what difficulties did you face when you tried to…? These probing TED questions help to pinpoint the relevant insight from a customer’s open response. The style of wording helps to prompt the customer into giving the advisor all the relevant information in regard to their query. To check that the call is going in the right direction, advisors should ask customers if they are happy and have understood everything that they have so far heard. This is called “pre-closing”. Are you happy with what you have heard so far? Do you like what you have heard so far? Do you feel comfortable with everything that I’ve said? There is absolutely no point in us asking questions if we are not prepared to listen. These advisors then, just like everyone else in the contact centre, need to be monitored. Remember that it is no good giving the team this information and expecting each advisor to take it in. 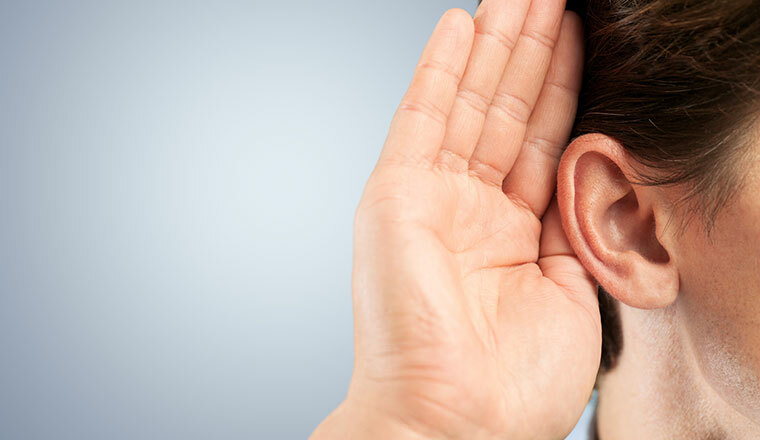 Team leaders and managers need to be listening in from time to time and offering their support. To better improve advisor questioning our readers and other industry professionals sent in their top tips, as highlighted below. Asking the customer if they have any other questions/anything else you can help with, at the start of a call, can aid in first-call resolution. Asking at this point allows you to plan how your questioning will flow. For instance, it may not be possible to address the first issue raised until the second issue has been resolved. It is a good idea to deal with each issue individually and go for the easiest or quickest issue to resolve first. This gives the customer a feeling that you are helping them and getting results. If the customer raises a new query during the call you should deal with it before closing the call. This technique negates having to ask the same question at the end of the call, which can increase call handling time as human nature often means if we are asked if there is anything else, we will try to find something. The key to effective questioning is simply to listen! By listening to your customer’s answers (the whole answer), you have time to formulate what your next question will be. 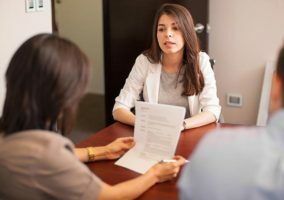 This will also allow you to ensure that the line of questioning has a natural flow and doesn’t sound like a scripted checklist of things you need to ask. By listening to your customer’s answers (the whole answer), you have time to formulate what your next question will be. The main part of this technique is to ensure you don’t jump from one subject to another. Use the Funnel Effect and move on to the next line of questioning after confirming understanding with closed questions. It is hugely important to listen to your customer. It is equally important to let the customer answer! If, when asking a customer a question, they aren’t immediately forthcoming with an answer, don’t rush in to fill the gap for them. It is, after all, pointless asking a question if you are going to answer it yourself from what you believe the customer might say. Control the silence by waiting for the customer to either answer or ask for clarification of the question if they don’t understand it. Use positive words and be energetic and enthusiastic in your delivery, as you need to motivate someone to consider the questions you are asking. Ideally, you want to inspire them to respond in a likewise manner and to open up the call into a conversation rather than a set of questions and answers. Use your voice to project professional confidence as your customer needs to have confidence in you, and write down what you want to say and recite this so that you are prepared. Also, remember that attention should be given to ensuring that conversations are natural and not forced, while you should listen to what your customer has to say and link the answers into the next question. Relevant probing helps unearth the customer’s need and reduces Average Handling Time (AHT). We need to encourage advisors to ONLY do relevant probing when they seek answers to help customers. LISTEN to the main query attentively. This helps to get many cues from the query itself – hence reducing the need to probe. Do open-ended probing when you need to recommend something to a customer or when the customer is facing an inconvenience. Ensure closed probing when you need the reply in just a yes or no to hand-hold the customer. The context and manner of probing must be clear for the customer to understand instantly, and courteous for them to respond similarly. Most important is ensuring that any interaction with a customer occurs as being conversational, relevant and intelligently positioned. Customers should never feel they are being asked a random question that has no relation to the discussion, and this can often happen when reading from a script. Effective call centre advisors should be able to gain meaningful insight and information from customers by positioning their dialogue in a manner appropriate to the individual conversation. When advisors read from a prompt, it can be hard for them to emotionally connect with callers. An advisor that sounds interested and involved in the discussion is more likely to make the consumer feel they have got some value to gain. The most effective way to develop advisors to a high standard is not to use a script and to get them to envisage themselves as the customers. They are then in a better position to understand the process and advantages to their conversations, and empathise with a consumer’s decision-making process. Empower advisors with information and support them as valued resources and they will be confident in knowing how, and when, to ask the right questions. Originally published in February 2010. Updated in September 2018. Highly informative article. Keep up the great work. Nice article, thanks. Very useful. Check typing error in the title though. I can personally say that these techniques are effective in encouraging conversation and problem resolution. this has helped me a lot as a call center agent. It is very powerfull and effective. great article and very useful information. Questioning your customer is a process that needs extra care and attention. The customer should never be provoked and neither should you. The initial step is to gain permission to indirectly to question the customer on anything. To do so, you must be friendly and understanding.